Do kids only need ‘college’ because high schools are failing? Amy Otto believes “the Obama administration’s overall push for more school before and after K-12 is a way to avoid solving the real problem”. The “real problem” that needs urgent attention is K-12 education, but President Obama proposes “to spend money on preschool or community college instead of substantive reform of K-12”. Do Kids Need ‘College’ Because High Schools Aren’t Doing Their Job? Mandating “free” thirteenth and fourteenth grades via community college should make one wonder what is going wrong in tenth through twelfth grade that makes two more years of de facto public school now necessary. Only increasing opportunity can reduce poverty. More “free” preschool or thirteenth grade only serves as palliative care for those in poverty. These programs don’t spark real change, as demonstrated from studies from Obama’s own administration. It’s a tacit admission from Democrats that their goal is not to eliminate poverty but to paper over it with politically charged policy. In fact, what would animate the Democratic Party if poverty were significantly reduced? They much prefer the self-satisfaction of saying they care without ever having to produce results. If no one were poor, whom would they have to feel superior to? That’s the problem Democrats won’t be addressing any time soon and it’s the one that deserves this nation’s attention. Institutionalizing children earlier and longer won’t lead to more creativity and innovation, which are the real stimulus of economic growth. Real-world experiences—whether it play when young or entry-level jobs when they’re teens—are being taken off the table while politicians mandate more isolation and testing within the confines of public school. Don’t fall for the bait and switch. It’s time to tackle the real challenge that we are already paying too much for universal education and getting diminishing returns. Even though Head Start produces no long-term benefits, Obama pushes for more of the same. His recent idea of “free” community college only emphasises the failure of our existing K-12 system to produce competent graduates. … More “free” preschool or thirteenth grade only serves as palliative care for those in poverty. These programs don’t spark real change, as demonstrated from studies from Obama’s own administration…. Otto offers only vague ideas for alternative solutions: more real world experiences in the form of less structured child care and entry-level jobs for teens. Those may be helpful, in theory at least. Actually implementing them successfully is a whole other challenge. Poor single parents are not easily trained to properly nurture their children and jobs are not instantly created by government dictum. But if Otto’s ideas are not the best solutions, then “free” preschool and college certainly also fail the test for the best use of taxpayer money. Amy Otto, “President Obama Pushes Pre-K And ‘Free’ College Because He’s Got Jack For K-12”, The Federalist, January 23, 2015. Why did President Obama do such a quick about-face on 529 plans, first proposing to eliminate them and then a few days later dropping that proposal? Although it was widely believed that this initiative had zero chance of getting through Congress, it appears Obama’s actions were due to the efforts of the elusive “middle class”. Several news sources have pointed out how poorly this proposal polled, notably with Democratic voters. It seems the administration could have predicted this reaction, but apparently they were blindsided. Obama’s proposal would have penalized wealthy families the most, since 70% of 529 “tax benefits go to households earning more than $200,000”. As such, “middle class” families would not be seriously hurt by this change. But here’s the rub. The vast majority of Americans consider themselves middle class, including many with household incomes well into the six-figure range. Don’t tax me, tax that rich guy over there. President Obama’s State of the Union proposal to end the tax benefits for college savings accounts ran afoul of these rules, which is why he abandoned it, under intense pressure from both political parties, within a week. Tax-free college savings accounts, like the mortgage interest deduction and the state and local tax deduction, principally benefit people who range from affluent to wealthy. In pushing its proposal, the White House pointed to Federal Reserve data showing that 70 percent of balances in the college accounts were held by families making at least $200,000 a year. In theory, tax reform is supposed to be built around cutting back preferences like these, in order to pay for some combination of lower tax rates and tax preferences aimed at people with lower incomes. Politicians have met with strong resistance to increasing taxes on the “merely affluent”. But in practice, politicians from both parties have made a point of holding the group you might call the “merely affluent” harmless from tax increases. If you make $150,000 to $225,000, you make about two to three times the national median income for a married couple. The list of occupations that can get you into this income bracket — government official, academic, lobbyist, journalist — can sometimes make it hard for people in political circles to remember that 92 percent of American married couples make less than $200,000 a year. A lot of people in this category don’t think of themselves as rich, and they benefit from tax provisions like college savings accounts. So how can politicians raise more tax revenue? It’s a challenge. … If you can’t go after tax provisions for the merely affluent, you are exempting almost everyone from tax increases. And if you can’t broaden the tax base, then you are very limited in how much you can finance tax reform. Where else can they find the money? Raising taxes on the very rich won’t raise enough revenue to balance the budget, and the bottom 50% of income earners — who only pay about 2% of all federal taxes — are not a likely source. Peter Suderman of Reason believes the 529 debacle shows that the “existing welfare state is unaffordable”. On the other hand, Reihan Salam of Slate laments that the upper middle class is ruining all that is great about America. In essence, both may be saying the same thing. It’s hard to finance expansive government programs because “eventually you run out of other people’s money”. Josh Barro, “A ‘Rich’ Person Is Someone Who Makes 50 Percent More Than You”, New York Times, January 29, 2015. First encourage more student debt, then promote nonpayment. One of the slow-rolling and under-reported government debacles is the rising amount of student-loan debt that is guaranteed by taxpayers and will never be repaid. Thanks to the federal takeover of the student-loan market in 2010, the Education Department now stands behind more than $1 trillion in outstanding debt. Less well known is how the same federal government that has promoted and subsidized this debt is also scheming to make sure it doesn’t have to be repaid. Income-based repayment programs are one way for borrowers to shift responsibility over to taxpayers. So-called income-based repayment programs reduce a borrower’s monthly payments and then forgive the remaining principal after a period of years. Graduates who choose the nonprofit and government jobs favored by the President can have their loans forgiven entirely after 10 years. Participation in expanded government debt relief plans has doubled over the last year. The Obama administration greatly expanded benefits under income-based repayment plans in recent years and has launched efforts to promote them. Enrollments are growing rapidly and now stand at an all-time high. Some 24% of Federal Direct Loan Program balances ($115 billion) that have come due are enrolled in the two most generous plans, Income-Based Repayment and Pay As You Earn. That is up from 14% a little more than a year ago. The number of borrowers using the plans has doubled over that time, to 2.2 million. At the same time, default rates are trending upward. This at a time when the economy is supposedly improving. Student loans are promoted for everyone, regardless of qualifications. And loans are being made easier “not to repay”. This all makes sense, however, when you realize that the student-loan program has been designed to achieve two political goals: Loans should be available to any student, at any school, pursuing any credential; and student debt is bad and burdensome, so it should be easy for borrowers not to repay. Based on these goals, the program is performing quite well for students and the institutions whose coffers swell under such loose lending standards. Loan issuance has grown rapidly in recent years while repayment rates have declined steadily. From the perspective of the taxpayers who must ultimately finance these liabilities, however, the federal student-loan program is performing badly and steadily getting worse. Here is another prediction that IBR schemes “will dramatically increase in 2015”. Use and availability of income-based repayment (IBR) schemes, which set repayment expectations at a set percentage of the student borrower’s post-college income, will dramatically increase in 2015. This is because policymakers have narrowly defined the student debt problem as a problem of student borrowers struggling to keep up with payments (i.e., avoid default). Therefore, setting payments at a more affordable level would seem to resolve the problems student debt creates…. Meanwhile in New York, Gov. Andrew M. Cuomo will propose new legislation to forgive the student debt of thousands of college graduates. “Your Taxpayer Tuition Bill”, Wall Street Journal, Dec. 30, 2014. Jason Delisle, “The Hidden Student-Debt Bomb”, Wall Street Journal, Dec. 30, 2014. NPR Ed Team, “Kindergarten Entry Tests And More Education Predictions for 2015”, NPR, Jan. 3, 2015. Kate Taylor, “Cuomo to Offer Plan to Cut College Graduates’ Debt”, New York Times, Jan. 3, 2015. After a compromise was finally reached last week, a new student loan bill was sent to President Obama for signature. Under the old federal student loan program, borrowers were offered a fixed rate. Under the new rate structure, which still drew opposition from nearly one-third of Senate Democrats when it passed last week, loans to undergraduates and graduate students, along with parents in the PLUS program, would be subject to a fixed rate plus the yield on the 10-year Treasury note. Rates for loans taken out after July 1 of this year would be 3.9 percent for undergraduates, 5.4 percent for graduate students and 6.4 percent for those receiving PLUS loans. The rates are fixed over the life of the loan but would change for new borrowers each year. In a compromise that pleased many Democrats who had initially been wary of using a rate that was subject to inflation and fluctuated with the markets, Congress set a cap on all loans: 8.25 percent for undergraduates, 9.5 for graduate students and 10.5 for PLUS recipients. Perkins loan rates were unchanged. * Interest is paid by the federal government during the in-school period. Are climbing college completion rates a good trend? 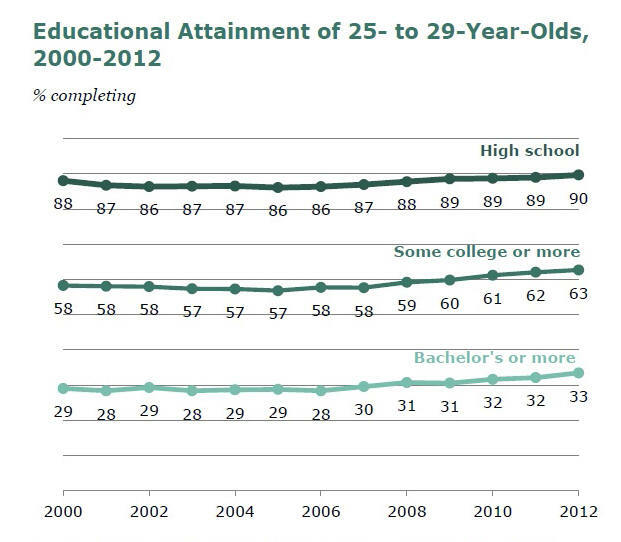 College completion rates continue to climb, as shown by these charts from the Pew Research Center. For years, the idea has been growing that college is as necessary as high school was 40 years ago. In 2010, 75 percent of Americans said college was very important, compared with just 36 percent in 1978, the report notes. President Obama has set a goal for the US to lead the world by 2020 in the percentage of young people earning college degrees or postsecondary certificates. The increases in the Pew report indicate a “rather slow climb” that would need to accelerate to meet the president’s goal, says Sara Goldrick-Rab, a professor of educational policy studies and sociology at the University of Wisconsin-Madison. While the long-term trend is up, recent increases could be related to the difficulty of finding jobs during the latest recession. 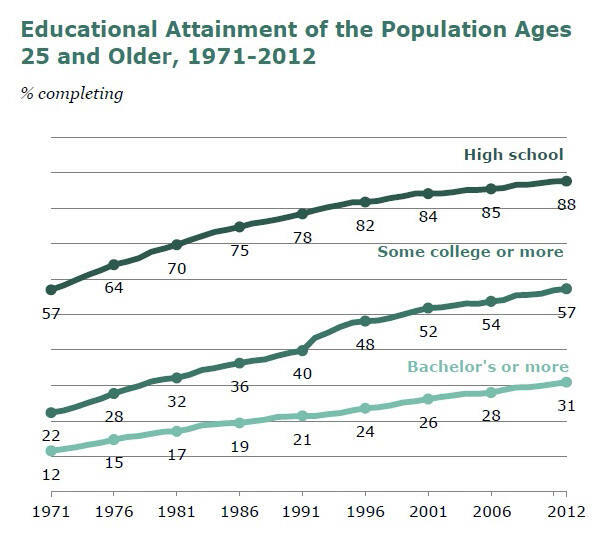 During better economic times, education attainment rates have been more stagnant. It’s possible, Fry says, that rates will tick downward somewhat as the labor market improves. 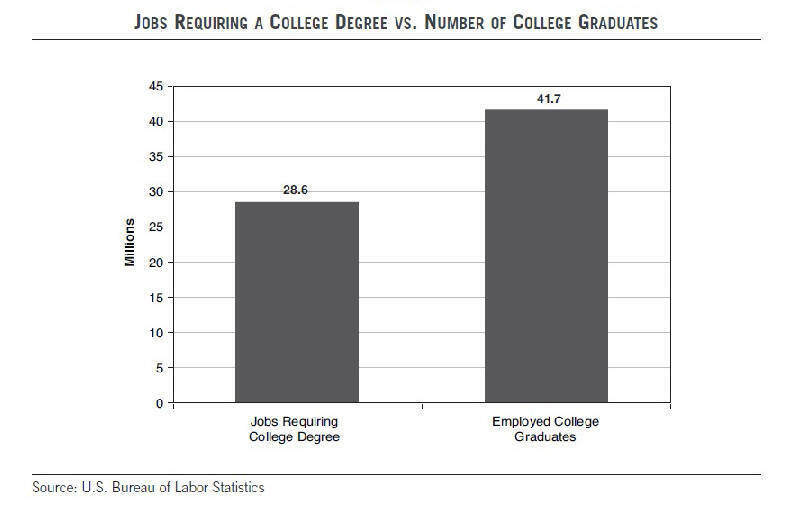 Maybe lower education attainment rates would be a positive change, since we have too many college graduates chasing too few college-level jobs. Good question. Why? Doing what you’re told? Nothing better to do? Putting off the time when the consequences of your decisions become apparent? High self-esteem leading you to think you’re the exception to the trend? Being part of the trend, going where everyone else is going? Posted in higher education bubble, jobs after college, trends | Comments Off on Are climbing college completion rates a good trend? … Tonight, I’m announcing a new challenge to redesign America’s high schools so they better equip graduates for the demands of a high-tech economy. We’ll reward schools that develop new partnerships with colleges and employers, and create classes that focus on science, technology, engineering, and math – the skills today’s employers are looking for to fill jobs right now and in the future. Tonight, I ask Congress to change the Higher Education Act, so that affordability and value are included in determining which colleges receive certain types of federal aid…. … And tomorrow, my Administration will release a new “College Scorecard” that parents and students can use to compare schools based on a simple criteria: where you can get the most bang for your educational buck. Boys may be suffering from stereotype threat. The belief that girls are brainier and better behaved is holding boys back at school, research suggests. A study of British pupils found that, from a young age, children think girls are academically superior. And, what’s more, they believe that adults think so too…. And by the age of seven, boys shared the belief that they were naughtier and did less well at school. Follow-up questions showed the children thought that adults had similar expectations. Noncognitive skills come into play in boys’ poor school performance. One source of the persistent female advantage in K–12 school performance and the new female lead in college attainment is the higher incidence of behavioral problems (or lower level of noncognitive skills) among boys. Boys have a much higher incidence than do girls of school disciplinary and behavior problems, and spend far fewer hours doing homework (Jacob, 2002). Are boys’ poor behavior and low academic performance partly due to low expectations? Dr. Helen wonders if teachers tend to use grades to punish boys since other discipline options are more limited. A related aspect is that much of early academic success may hinge on noncognitive and literacy skills, which boys tend to develop later than girls. Chimpanzees can far outperform humans in some mental tasks, including rapidly memorising and recalling numbers, Japanese scientists have shown. A good working memory is needed to survive in the wild. Prof Matsuzawa, who combines the study of wild chimpanzees in west Africa with research using the captive colony in Kyoto, said such a good working memory – the ability to take in an accurate, detailed image of a complex scene or pattern – was an important survival tool in the wild. For example, the apes can quickly assess and remember the distribution of edible fruit in a forest canopy. Or, when two rival bands of chimpanzees encounter one another, they can assess the strength of the rival group and decide whether to fight or flee. Most reviewers are underwhelmed by the Obama adminstration’s new College Scorecard intended to help families compare schools and learn ” where you can get the most bang for your educational buck”. The scorecard is “not a game-changer as much as the administration would like to believe,” said Terry W. Hartle, senior vice president of the American Council on Education, a major association of colleges and universities. Average Net Price: What an undergraduate student pays after grants and scholarships are subtracted from the institution’s listed cost of attendance. Graduation Rate: Number of students who graduate within six years at four-year institutions and three years at two-year institutions. Loan Default Rate: Percentage of students who default within three years of entering repayment. Median Borrowing: The median amount borrowed by undergraduate students. The data is not recent and already available elsewhere. But some of the data in the new scorecard is a few years old, and most of it has been available from other sources, notably the federal government’s own College Navigator site. Further, the information is presented as averages and medians that might have little relevance to individual families. The scorecard does connect to each institution’s net price calculator, which allows individualized cost estimates, but it does not provide side-by-side comparisons of multiple schools, as other government sites do. Like many other resources for families deciding on higher education, the College Scorecard is a good starting point. The most time-consuming part of the college search is typically in uncovering details about departments, teaching, career preparation, personalized costs, campus culture, and other aspects that are not easily packaged in scorecard fashion and are often inscrutable to the typical applicant. U.S. student-loan debt rose by $42 billion, or 4.6%, to $956 billion in the third quarter, the Federal Reserve Bank of New York said Tuesday. Overall household borrowing fell during that period. Payments on 11% of student-loan balances were 90 or more days behind at the end of September, up from 8.9% at the end of June, a rate that now exceeds that for credit cards. Delinquency rates for all other consumer-debt categories fell or were flat. By design federal student loans are easy for almost anyone to get. Nearly all student loans—93% of them last year—are made directly by the government, which asks little or nothing about borrowers’ ability to repay, or about what sort of education they intend to pursue. President Barack Obama championed easy-to-get loans during the campaign, calling higher education “an economic imperative in the 21st century.” A spokesman for Education Secretary Arne Duncan said the goal is “to make student loans available to as many people as possible,” and requiring minimum credit scores would block many Americans from going to college…. … the government demands no collateral and has no underwriting requirements…. Jackson Toby, a retired Rutgers professor and adjunct scholar at the American Enterprise Institute, recommends reforms that would make student loan lending standards similar to those of other consumer debt. This change would exclude many lower-income students. He proposes that students undergo a comprehensive assessment of credit-worthiness, including how much debt they currently have, their academic history and their expected income upon graduation, given their major, before getting federal student loans. Imposing tougher standards would exclude some potential borrowers. “You would have loans only going to upper-income students at the best colleges,” said Mark Kantrowitz, who publishes Finaid.org, a student-aid website. Other charts among the WSJ’s top picks cover the changes in categories of consumer spending over the last century, how unemployment benefits differ among the different states, and how deficit spending has become the norm in recent years. BUFFALO — High school students in Yonkers and 16 other poor districts will have better access to advanced placement courses under a program featuring virtual classrooms. The state Education Department this week said $17.3 million in federal Race to the Top Funds will be distributed to 17 districts or consortia of districts under the state’s Virtual Advanced Placement Program. Education Commissioner John King says low-income students don’t always get the chance to take AP courses, which give students a leg up in their college applications. The 18-month grants will fund the development of online and blended courses that combine online and traditional classroom instruction. Other districts receiving funding include New York City, Buffalo, Rochester, Niagara Falls, Huntington and South Huntington. »»» A baby boomer is feeling less guilty about leaving the younger generation with so much debt because, hey, it’s what the kids voted for. »»» Hispanic and African-American students lag behind white students in academic achievement, but surpass them in using smartphones for homework. That’s my takeaway from an article informing us that 1 in 3 middle-schoolers uses smart phones for homework. Nowhere in the article was there any mention that using these digital devices actually improves academic achievement. There are record numbers of student borrowers in financial distress, according to federal data. But millions of parents who have taken out loans to pay for their children’s college education make up a less visible generation in debt. For the most part, these parents did well enough through midlife to take on sizable loans, but some have since fallen on tough times because of the recession, health problems, job loss or lives that took a sudden hard turn. And unlike the angry students who have recently taken to the streets to protest their indebtedness, most of these parents are too ashamed to draw attention to themselves. —— College students voted in record numbers with most supporting Obama. According to Fair Elections, 19 percent of all voters this year were between the ages of 18 and 29, which is a percentage point higher than the turnout of young voters in the 2008 presidential election. Spaulding said while total number of young voters remained “on-par” with the numbers from 2008, in some states, such as California, the percentage of voters under 30 years old increased by over 5 percent. He attributes the spike in young voter turnout to the increasing ease of voter registration. Many first time voters are uninformed as to how and where to register which eventually causes them to miss out on voting entirely, he said. Spaulding said the rise of online registration is one of the biggest factors in increasing participation. Obama support slipped, but remained higher than for Republican candidate. In some battleground states, tallies show, their ballots were decisive factors in the president’s victory…. … Sixty percent of young people voted for him, compared with 66 percent four years ago…. … As in 2008, the edge young voters gave to Mr. Obama proved decisive in some states. According to Circle, in the battleground states of Florida, Ohio, Pennsylvania, and Virginia, if young people had not voted or if only half of them had supported the president, Mr. Romney would have won. —— Employees lust after pensions, but the memory may be better than the reality. … In several head-to-head questions, researchers asked whether workers would prefer it if their employers offered them a guaranteed retirement benefit (essentially a pension) or other perks. A large plurality – 49% — chose the pension over the opportunity to earn a bigger bonus…. … A generation ago, pension plans were offered to more than four out of five private-sector workers; today it’s fewer than one in three. Pensions have largely been replaced by defined contribution retirement plans like 401(k)s, which were hammered along with stock and bond prices during the financial crisis…. Since most 401(k)s are stocked with mutual funds, of course, the institute has a lot to gain from promoting the current 401(k) system. But the study is still worth note. The explanation: While many workers had access to pension plans thirty years ago, many failed to collect full benefits because of various factors. Switching jobs, for example, tended to reduce employees’ standing under formulas plans used to calculate payouts. The government moved to fix these problems with new laws in the 1970s and ‘80s, but by then the move to 401(k)-type plans was already underway.